The structure of the foot is complex, consisting of bones, muscles, tendons, and other soft tissues. Of the 26 bones in the foot, 19 are toe bones (phalanges) and metatarsal bones (the long bones in the midfoot). Fractures of the toe and metatarsal bones are common and require evaluation by a specialist. A foot and ankle surgeon should be seen for proper diagnosis and treatment, even if initial treatment has been received in an emergency room. A fracture is a break in the bone. Fractures can be divided into two categories: traumatic fractures and stress fractures. Traumatic fractures (also called acute fractures) are caused by a direct blow or impact, such as seriously stubbing your toe. Traumatic fractures can be displaced or non-displaced. If the fracture is displaced, the bone is broken in such a way that it has changed in position (dislocated). You may hear a sound at the time of the break. “Pinpoint pain” (pain at the place of impact) at the time the fracture occurs and perhaps for a few hours later, but often the pain goes away after several hours. It is not true that “if you can walk on it, it’s not broken.” Evaluation by a foot and ankle surgeon is always recommended. Stress fractures are tiny, hairline breaks that are usually caused by repetitive stress. Stress fractures often afflict athletes who, for example, too rapidly increase their running mileage. They can also be caused by an abnormal foot structure, deformities, or osteoporosis. Improper footwear may also lead to stress fractures. Stress fractures should not be ignored. They require proper medical attention to heal correctly. Non-union, or failure to heal, can lead to subsequent surgery or chronic pain. Rest. Sometimes rest is all that is needed to treat a traumatic fracture of the toe. Splinting. The toe may be fitted with a splint to keep it in a fixed position. Rigid or stiff-soled shoe. Wearing a stiff-soled shoe protects the toe and helps keep it properly positioned. “Buddy taping” the fractured toe to another toe is sometimes appropriate, but in other cases it may be harmful. Surgery. If the break is badly displaced or if the joint is affected, surgery may be necessary. Surgery often involves the use of fixation devices, such as pins. Breaks in the metatarsal bones may be either stress or traumatic fractures. Certain kinds of fractures of the metatarsal bones present unique challenges. For example, sometimes a fracture of the first metatarsal bone (behind the big toe) can lead to arthritis. Since the big toe is used so frequently and bears more weight than other toes, arthritis in that area can make it painful to walk, bend, or even stand. Another type of break, called a Jones fracture, occurs at the base of the fifth metatarsal bone (behind the little toe). It is often misdiagnosed as an ankle sprain, and misdiagnosis can have serious consequences since sprains and fractures require different treatments. Your foot and ankle surgeon is an expert in correctly identifying these conditions as well as other problems of the foot. Rest. Sometimes rest is the only treatment needed to promote healing of a stress or traumatic fracture of a metatarsal bone. Avoid the offending activity. Because stress fractures result from repetitive stress, it is important to avoid the activity that led to the fracture. Crutches or a wheelchair are sometimes required to offload weight from the foot to give it time to heal. Immobilization, casting, or rigid shoe. A stiff-soled shoe or other form of immobilization may be used to protect the fractured bone while it is healing. Surgery. 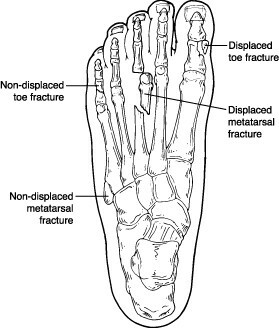 Some traumatic fractures of the metatarsal bones require surgery, especially if the break is badly displaced. Follow-up care. Your foot and ankle surgeon will provide instructions for care following surgical or non-surgical treatment. Physical therapy, exercises and rehabilitation may be included in a schedule for return to normal activities. For more information on broken toes, listen to the Broken Toes podcast.